The 1890 Grand Hotel has a colourful history and retains many of its original features, including a billiards table that served as an operating theatre after a man was shot in a gunfight on the premises. The upstairs floor is currently awaiting renovation, but visitors claim to have heard disembodied footsteps and have seen the apparition of a cattle rancher. The other main haunting occurs in the basement, where immigrants would wash their clothes in a designated laundry. Staff claim to have heard foreign voices emanating from the room, but no one is there. Others claim to have seen puddles of water that materialise and vanish in short periods of time with no apparent source. 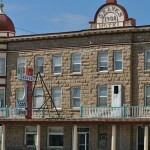 More Haunted Montana: Haunted Places You Can Visit If You Dare!